Should I have sinus surgery? Are there other options? Most people with chronic sinus problems will suffer with regular congestion or infections or both for years. Improper drainage of the sinuses can lead to chronic colds and flu, allergies, fatigue and more. Take endless decongestants, antihistamines, and nasal steroids? That will help you to contribute to the $5.8 billion a year that Americans spend on sinus treatments, according to the American Academy of Otolaryngology-Head and Neck Surgery Foundation. 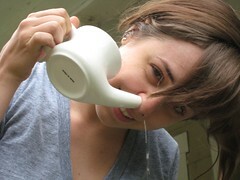 Use a neti pot or other nasal rinse device to try to keep your sinuses clear? Or you could be one of the 500,000 Americans that have sinus surgery every year! Some estimates say that up to 90% of sinus problems are really misdiagnosed headache syndromes. For instance Traci a patient of mine for about a year is a 44 years old female who has battled chronic sinus infections, facial pressure, and headaches for over 10 years. She had sinus surgery about 8 years ago, and have used various kinds of antibiotics and medicated rinses, but found no relief. Along with sinus trouble, she has scoliosis and chronic neck and shoulder pain for over 15 years. She was constantly “popping” ibuprofen to help ease all the discomfort she was in. She was always achy, edgy, and tired! She found out about NUCCA and eventually, decided to call and see if this was something that could help her. After a couple months, she really began to notice improvement in her neck mobility and pain. She felt as if it had been “unlocked” and she could move much more easily. Changing lanes on the freeway and backing out of a parking spot was easy again! As her neck pain improved, so did her shoulder pain. In fact, her scoliosis curve even improved! Over time, as her adjustments starting holding longer and longer, her sinuses started to clear up as well. With NUCCA it is not about being adjusted 1000’s of times it is about getting your spine in to the proper position and keeping it that way so that it can heal and function the way the body is designed to. She weaned herself from all sinus rinses and medications and haven’t had a sinus infection in 7 months. The facial pressure and headaches have decreased significantly and she definitely has more energy. She is even able to exercise again without chronic discomfort. Can your body heal itself from a chronic sinus problem or other chronic condition? Only one way to find out…take the next step and find a NUCCA doctor in your area to see if you have an Atlas Misalignment that is effecting the health and function of your body. Go to www.nuccawellness.com to schedule an evaluation today!